With a steady SW breeze blowing on Friday afternoon, Adrian and I decided to change our plans and head wide of Cape Cleveland in search of some Spanish Mackerel. The original plan was to target reds on the shoals, but given the SW forecast and the possibility that the reds would be shut down, we opted for Plan B. By 4pm we were over some rubble bottom wide of Salamander which usually holds good bait schools and plenty of Spaniards. To my surprise there was only a small scattering of baitfish and no sign of any mackerel as we trolled lures all through the area. 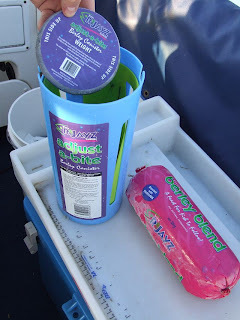 With daylight rapidly disappearing we pulled out the metal lures and loaded the R Jayz berley canister with the offshore berley mix while we continued to drift this area. The R Jayz berley system is absolutely awesome and is the best I have used, so check it out when next at your favourite Tackle store (stay tuned for a full product review soon). Within minutes the berley was working its magic and the bait school started to rise off the bottom, with some larger fish now also joining the action. 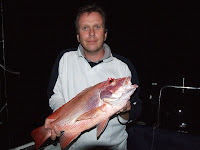 We hooked up immediately and a procession of Gold Spot, Blue Spot and Giant Trevally followed as we continued to drift while working metal lures. We could see a few Nannygai beginning to school on the bottom so Adrian dropped down some squid on a dropper rig and instantly pulled a few Nannygai – unfortunately no monsters, but it was encouraging to see that they were willing to bite. Dilemma time – the wind and swell had dropped off and we had about 45 minutes of daylight left. Do we head back to Salamander for some Queenies and the chance of a Spaniard, OR do we work our way across to the shoals and maybe find some Spaniards on the way and chase reds after dark? Always the eternal optimist, it was off to the shoal country. A few short stops along the way found only small bait schools, no Spaniards, but plenty of Trevally. We arrived at our target shoal just after dark, sent the R Jayz berley canister to work and began some drifts. A good school of Nannygai were soon located and we anchored perfectly, right on the fish. There are 3 reasons I always drift-fish a spot before I anchor – firstly you are able to sound out the entire area enabling you to locate the best school of fish; second, you can determine if the school is moving and in what direction; and third, you can accurately predict how you will hang at anchor so you can get it right the first time. 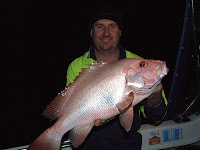 Thanks to a good berley trail we had fish un der us all night and pulled a mixed bag of Nannygai, Cobia, and Trevally. 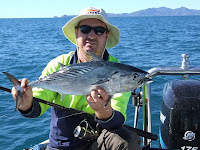 Best bait was fresh Trevally fillets and there seemed to be little difference in catch rates between myself using a running 5 bean sinker to a 7/0 tru-turn hook and Adrian using a dropper rig with a snapper lead. Actually, the only difference was that Adrian was tortured by not one, but 4 epic battles with some monsters of the deep leaving him bruised, battered and even spooled by one of the beasties! de may produce the Spaniards. Unfortunately, all we found was a noticeable lack of birds, baitfish and pelagics. Last stop was the northern cardinal and seas were considerably flatter inshore. Here we encountered a lone Mack Tuna that smashed a 40g sea rock and also a few half-hearted follows by some queenfish. All in all a challenging fishing trip that did not go at all as expected – the Spaniards will have to wait until next time!